It is that time of year in the garden that I envision for many months, beginning on frigid, dark winter evenings when I winter sow my first seeds of the year, when the garden outside is asleep under a blanket of snow. In the following months, seeds are sown, cuttings and seedlings are nursed along in the basement under lights, and all are eventually planted out in the garden over the course of a couple of weeks in May. When the plants I’ve raised are initially planted out in my garden beds, I always have a hard time imagining all that space between the tiny plants eventually filling in; my temptation is always to plant them a bit closer together than I know I should. After years of doing this, I’ve come to learn to trust that they always fill in, grow together into a tall hedge, and bloom. 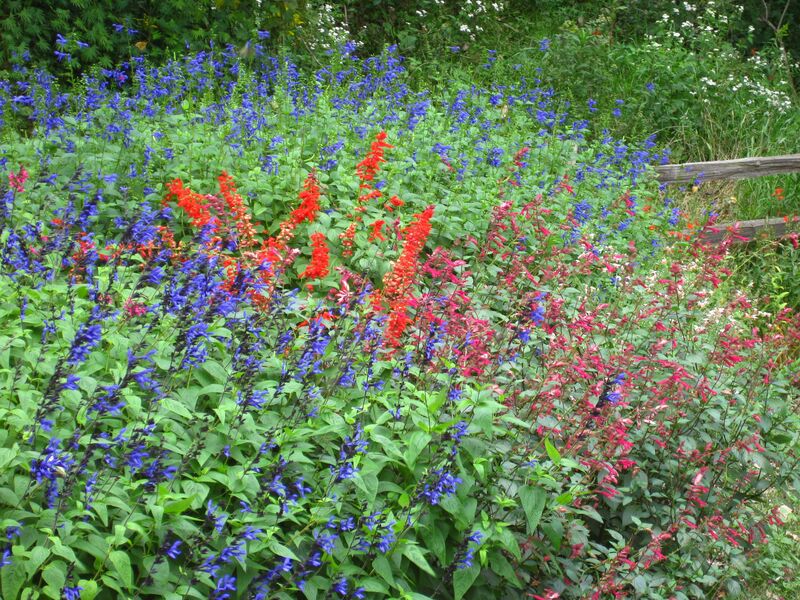 The peak of bloom of my large annual beds of Salvias coincides with the late summer hummingbird feeding frenzy. The young are out of the nest, the adults have turned their attention to migration, and all are feeding as much as possible to consume the energy they will need to make the journey back south to Mexico and Central America, where they will spend the winter. Use of my feeders peaks during the last half of August and first week of September, during which time I mix up about a gallon of nectar a day for the hungry hummers to consume. It is an absolute joy to be out in the garden at this time, hummers darting about among the masses of flowers, chasing others away from their nectar-filled flowers, born on the same plants I started from a tiny seed or cutting many months ago. Hey Donald. I didn’t know you had your own hummer/garden website. I found the link through Kathi Rock’s site. 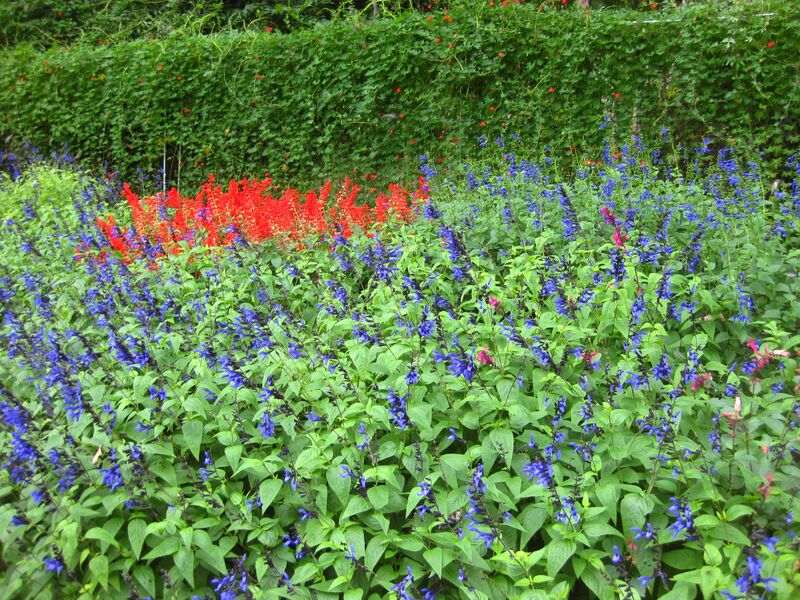 Two things stand out about your garden… the brightness of the yvonne’s salvia and the thickness of your guaraniticas. I’m sure having multi-year plants helps with thickness. I tried overwintering my guaraniticas last winter, but it was a big failure. I don’t know what the problem was. I’ll try again this year. Dan: Thanks for the comment. 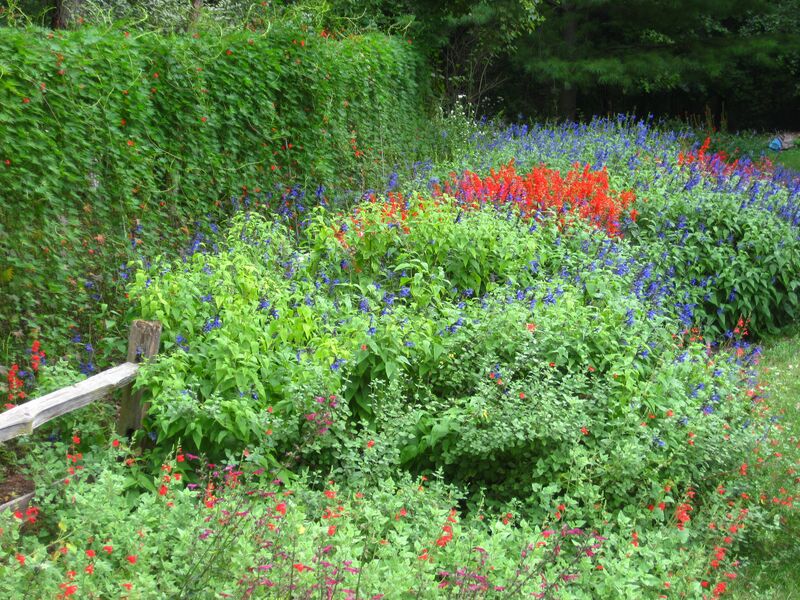 My garden really improved once I figured out methods for overwintering guaraniticas, which form the matrix of my garden. Most of my guaraniticas are overwintered by digging them up after first hard freezes kill off the tops. I store the dormant below-ground parts in bins of peat moss in my unheated garage. They require very little if any attention over the winter while they are dormant. It is nearing time to dig them up in a month or so, and I plan to do a post about the process with lots of photos. Donald, didn’t you have a bunch of scarlet spires at the front of your garden bed last year? Dan: Good memory–yes, I had a more extensive grouping of ‘Scarlet Spires’ in the front of my border last year, all grown from overwintered cuttings. Last winter, I didn’t take cuttings, but I did protect a small portion of the ‘Scarlet Spires’ with bagged leaves and a tarp, which did the trick for that small patch. That smaller patch survived and did very well this year, and is still blooming very well now. You reminded me that I need to get some cuttings of it this weekend–I really like this cultivar and plan to grow more of it again next year. It is extremely easy from cuttings, and overwinters well in the basement.